As an actor Hugo Weaving has already had a good innings. Agent Smith in the Matrix, V in the brilliant V for Vendetta, Elrond in The Lord of the Rings (and The Hobbit - when it too finally gets off the ground), and as the voice of Megatron in Michael Bay's Transformers movies. Now he's officially the man Marvel Studios has selected to flesh out the role of The Red Skull, in 2011's The First Avenger: Captain America. While the actor and role have long being rumoured, the official word locking in this great choice of casting is still awesome to have. 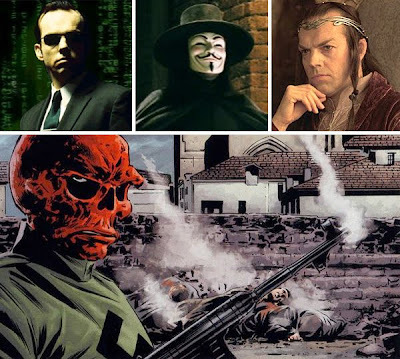 Mr. Weaving is perfect for the role of the Red Skull, I am excited to see how the Red Skull would look like in the big screen. Come to think of it he might even steal the show from Captain America himself. Hey Vic - thanks again for the great comments! I agree - I think if Chris isn't to careful Hugo could easily steal the spotlight in this one! oh man that is sick! Hugo Weaving going back to being a bad guy i love it. but can he do a german accent?